One of the best value, all round Sports Tourers on the Market right now, this super spacious Estate Insignia from Vauxhall is the 2.0 CDTi SRi Edition - Finished in Sparkling Haydan Silver Metallic and loaded with extras including 18" Sport Alloy Wheels, Gloss bLack Interior Trim, Hands Free Phone Prep, Leather M/F Wheel, Cruise Control, Auto Lights, Auto Wipers, 6 Speed Manual Gearbox, CD/AUX, E/W, E/M Alloy Roof Rails, Tow Pack, Rear Sensors, Soft Close Bootlid and much much more!!!! Blending premium design with impressive levels of comfort and refinement, the Vauxhall Insignia is no ordinary hatchback. The car's sleek roofline and sweeping contours give the Insignia a sporty feel, while the cabin is well equipped and designed to provide optimum comfort on even the longest of journeys. 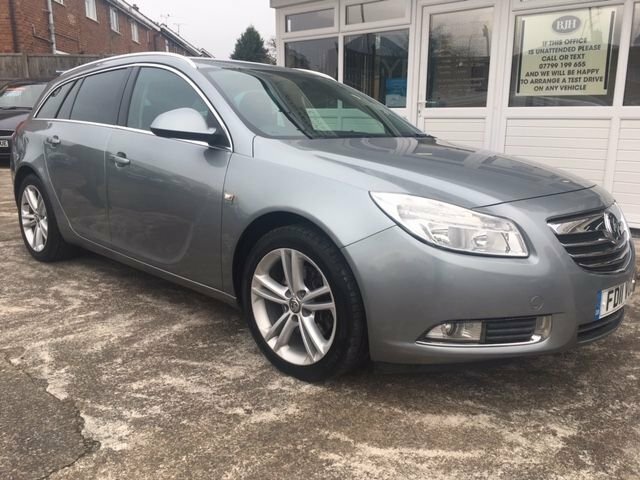 Why not take a close look at the range of used Vauxhall Insignia models for sale in Worcester here at BJH Motors and Sons and then contact a member of our showroom team to discuss your options in more detail. All of the cars you'll find here on the website have been thoroughly inspected before going on sale, so you can buy with complete confidence.